Nestled on 155 scenic acres of rolling bluegrass just northwest of Lexington, KY, Three Sisters Farm is a unique lay-up facility that caters to its equine clientele and their owners. From top racing athletes to show horses and beloved pasture pals, we offer personal and professional one-on-one care for optimum health and rehabilitation. Our intimate facility provides 24 hour care, specializing in the treatment of a wide variety of post-surgical, orthopedic and general medicine cases. We excel in the successful rehabilitation of basket surgery cases as well as those with delicate wound revisions. We also offer sales preparation and “R & R” for horses transitioning into new careers. Windows in each roomy stall open to idyllic, relaxing views of our spacious paddocks, allowing the sweet breezes of the bluegrass to nurture horses into glowing health. We invite you and your horses to experience the warm and dedicated service that is the hallmark of Three Sisters Farm. SITE UNDER CONSTRUCTION! 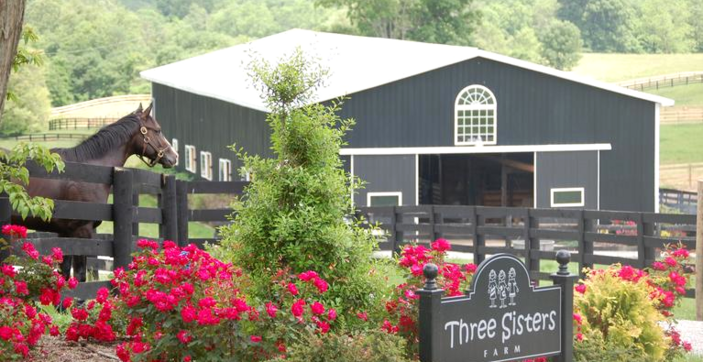 IF YOU WOULD LIKE TO CONTACT US, PLEASE CALL (859) 329-1109 OR EMAIL US AT THREESISTERSFARM@YAHOO.COM.